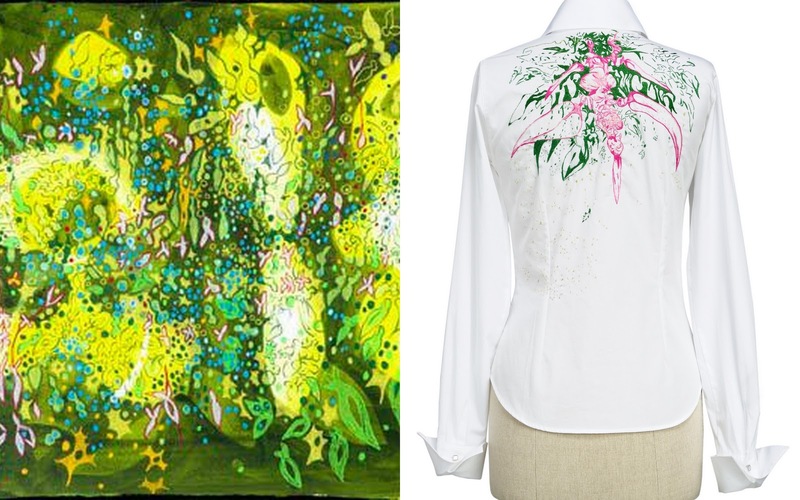 I love seeing art translated into fashion - especially when it's for a good cause. Anne Fontaine has teamed up with German-Brazilian artist Janaina Tschäpe on Precieuse, an organic line of shirts and collars to benefit the Anne Fontaine Foundation in its mission to save the Brazilian Atlantic Forest. The collection arrives in stores on October 20th, just in time for Forest Day (who knew? ), and sales of Precieuse products will benefit reforestation efforts in Brazil's Mata Atlântica. Plus, in celebration of Forest Day, half of all sales at Anne Fontaine stores tomorrow will be donated to the foundation. If you're in Boston, you can check out Tschäpe's designs and original window artwork tomorrow at the Anne Fontaine store at Heritage on the Garden, right by the Arlington T stop.